If you are a business owner or you run a venue, you’ll know how important it is to make a good first impression with customers by making sure you maintain a pleasant environment. Your employees will also work better if they appreciate their place of work. That’s why you have to keep the upholstery in your business well maintained. If you own a venue, regular maintenance is crucially important when you take into account the increased potential for spillages and the high volume of people using your chairs and sofas. MetroClean’s commercial upholstery cleaning services can help improve the look and feel of your workplace and ensure that the furniture you have invested in lasts for longer, saving you the cost of paying for expensive replacements in the future. Without regular maintenance, upholstery can quickly become dull, tired and lifeless. Our focus on properly training our staff and our powerful, truck mounted steam extraction equipment allows us to rejuvenate the colour, brightness and finish of your upholstered furniture. All upholstery eventually requires professional care. On top of our advanced knowledge, the equipment we have invested in helps us to address the many different challenges one might face on an upholstery cleaning job. We are fully trained and insured to tackle the cleaning of any kinds of upholstery you might have in your business. We have plenty of experience dealing with upholstery in a variety of commercial settings across Liverpool. You can save a fortune in the long run by having a smart maintenance programme in place for your business. We tailor our services to cater for your specific needs. Whether you run a small office or a large venue, our exceptional level of customer service and attention to detail remains the same. Give us a call on 0151 281 7466 today for a free quote! 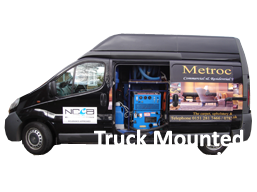 Along with carpet cleaning, upholstery cleaning, leather care, rug cleaning and commercial cleaning, MetroClean also provide a friendly, personal re-upholstery and fabric repair service throughout Liverpool. We cover all areas of Liverpool and take great pride in our work, having built our business through positive recommendations.